Meadow Gardens G.C. | Swan-E-Set Bay Resort & C.C. “When I two-putted from the middle of the green on 18 I had to wait for Michael to see if he made his 10-footer for birdie to force a playoff, and when it missed, I almost couldn’t believe it, like what just happened? I just won the Vancouver Open”! When asked about his affinity for Swaneset (He won at the West Coast Golf Group Pro-am in 2013 in a 5-hole playoff versus Nick Taylor), he commented “My driver is the strength of my game and to a lot of players the course seems intimidating off the tee with a lot of fescue grass on both sides of the fairway. So I guess it gives me a bit of an advantage that I can take driver out on holes where some guys can’t. “We also play at Swaneset often enough where I am comfortable on the greens so I can make my share of birdies. I had a goal of 12-under par for the tournament and was happy to get to that number at the end of the event”. Gligic and Cornelson were not the only 2 having stellar days on Saturday. After an opening 67 at Meadow Gardens, one of the local BC favorites Riley Wheeldon of Comox, BC would struggle on day 2, shooting 73 for a 2-day total of -4 and would start the final round 4-shots off the pace. 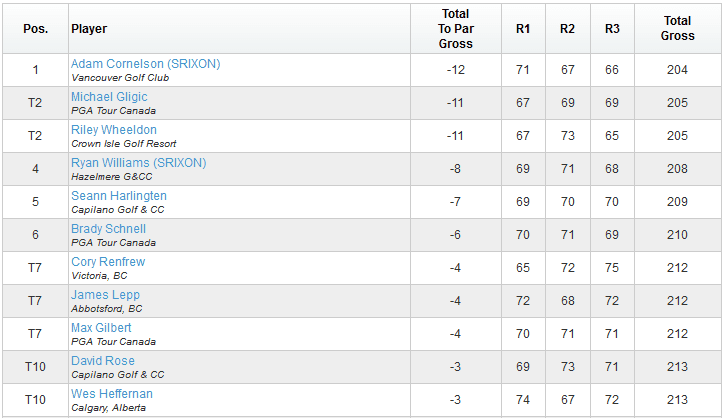 So with Cornelson and Glicic lighting the front 9 up, you’d think no-one would have a chance of catching them. Guess again. Wheeldon “wheeled off” 5 birdies in the first 6 holes, and missed a 4-footer on 9 that would have had him shoot 30. This closed the gap only 1 shot on Gligic, but this didn’t deter Wheeldon from continuing to press on the lead, as he birdied 10 and 14 to get to 11-under par, where he would finish for the tournament. His miss on the 9th hole would end up costing him a chance at a playoff, but considering coming off an injury it was a great tournament for him and a nice way to finish with a 65 to prepare him to defend his crown this week up at Fort McMurray on the PGA TOUR Canada. Both Gligic and Wheeldon took home cheques of $4,400 each for a share of 2nd place while Vancouver’s Ryan Williams fit in another very solid performance on the VGT with a 4th place finish (69, 71, 68) and a $2,800 cheque. A total of 7 BC Pros finished in the top 10 of this year’s Van Open, showing once again the strength of play in our Province! Vancouver Open Champion Adam Cornelson will tee-it-up with his PGA TOUR Canada colleagues this Thursday in Fort McMurray where he’ll be working on keeping the trend of Van Open Champions moving on to play on the WEB.COM!! He’ll be looking to either grab one of “THE 5” spots to graduate onto the WEB.COM or by earning a spot at WEB.COM final Q-School by placing in the top 10 of the PTC money list! At the end of the 54-Hole event it was 20 year old Emmett Oh of Calgary, Alberta who prevailed as our overall Amateur Winner, carding rounds of 72, 72, 73 for a 217 total and 1-shot victory over Vancouver Golf Club’s Michael Belle (73, 74, 71). Oh made the trip from Calgary with friend Brett Hogan to compete in the RBC Canadian Open Monday Qualifier and then stayed on to compete in the Vancouver Open. It was his first trip to BC to compete in the Vancouver Open and it was a fruitful one for him, taking home a Samsung LED flat screen for the win and getting his name etched on the Low Amateur trophy alongside 3-time winner Adam Svennson. Let’s hope there was enough room in the back seat of the car for the TV! Hogan finished 2 back of Oh with a strong final round of 71 to leap a number of players including 17 year old Pitt Meadows Golf Club Member David Lee, who fired opening rounds of 74, 71 but struggled with a 78 on the final round to finish T5th. And had it not been for a an erratic round on day 2, it might have been Royal Colwood’s Darren Day who could have walked home with the Van Open Amateur Title. Day’s card lit up like a Christmas tree on day 2 with 5 birdies and 2 eagles! But 5 bogeys, 2 doubles and a triple made for a sloppy round of 75. He would clean up his card considerably on day 3 with a very nice round of 70 and place 4th overall in the amateur competition. In the Amateur flighted side of the Vancouver Open Championship, twenty-one year old Noah Lee, also from Langley, BC took home the Overall Net Championship with a 3-day score of 208 (-8). He shot gross scores of 75, 82, 77 with a 9 handicap and won the net title by 2 shots over Coquitlam’s Russell Westcott and 3 shots over South Pacific Golf Association’s Raj Singh. Not bad considering he has only played golf for just over 1 ½ years! Lee stated emphatically that he is setting his goal of qualifying for PGA TOUR Canada in the spring of 2015! The Vancouver Open serves a number of purposes, and one of those is to fundraise each year at the Charity Pro-am on the Tuesday of the tournament. The official number is not in yet, but VGT expects to raise a substantial amount of money for The FIRST TEE PROGRAM of Greater Vancouver. In the past 5 years, VGT has raised over $25,000 for charity through the Charity Pro-am and gate admissions. The Vancouver Open marked VGT’s sixth MAJOR SERIES event of the spring. At the conclusion of the next VGT event (West Coast Golf Group Invitational) the top VGT Majors Pro will win the MAJORS SERIES Order of Merit Bonus which includes a FREE ENTRY to the Great Lakes Tour’s Southern Ontario Open in 3rd week of July!! As of the end of the Vancouver Open, Vancouver’s Ryan Williams (21,900 pts) holds a stronghold on the top spot over West Vancouver’s Seann Harlingten (16,700) and Langley’s Cornelson (16,100). Our volunteers are an integral part of the Tour, especially the demands of a multiple venue event like the Vancouver Open. As such, we would like to thank all our volunteers who have graciously donated their time this year and specifically to all the volunteers from the McCleery Ladies Club during this year’s Vancouver Open. We couldn’t do it without your support!! Our gratitude goes out to our 8-YEAR TOUR’S TITLE SPONSOR MARKETPLACE IGA for helping us launch the Vancouver Golf Tour so we can provide great tournament opportunities for our local players aspiring to reach the PGA Tour. We would like to take this time to thank all Vancouver Open tournament sponsors, starting with our PRESENTING SPONSORS of this year’s Vancouver Open – JOHNSTON MEIER INSURANCE AGENCIES and CNA Canada. We also need to recognize our Charity Pro-am Title Sponsor SAPUTO, and all of our wonderful Major and Supporting Sponsors who make this as great as it is for all golfers! Your support is greatly appreciated!! Thanks once again to Meadow Gardens Golf Club and Swaneset Bay Resort & CC for providing our players with 2 great venues to play! Our continued thanks go out to everyone involved with Operations at both courses for making this year’s Vancouver Open a very special one to remember. Both golf courses were in absolutely mint condition, and we have had nothing but positive reviews from this year’s players who travelled from afar to play our event!! Congratulations to both Head Superintendents John Hart (Meadow Gardens GC) and Kevin Neufeld (Swaneset Resort & CC) for the special attention to detail you provided for our event to set your golf courses in exceptional condition and for making this year’s Vancouver Open one to remember for all our players!! Lastly, thanks to all Pro-shop and Clubhouse Team members at Meadow Gardens and Swaneset Bay Resort & CC for providing our Van Open Team access to your facilities and for supporting the rigorous schedule of our event! Michael, Frank, Joel, Hannah (Meadow Gardens) & Michael, Helen, Tim, Troy (Swaneset Bay Resort). You should all be extremely proud of how the golf course operations teams supported the Vancouver Open event and made for a great event for both the players and our team this year! We look forward to paving the way for our 2015 Vancouver Open Champion from today until this time next year! Thanks for following and continuing to support local golfers on their way to the PGA TOUR and WEB.COM! !